I always think of Keats when I run into Miss Elytis. Today, while picking up hyasynth Tiramisu's new outfit (below), I ran into Darkling. We are bad for each other's pocket books. She's the one that whispered the name of a certain AO creator to me (I adore my AO), and also encouraged me to purchase a number of TESLA's ankle boots. I think we're good shopping companions because we stand around and gossip about naughty things while purchasing; we also share a taste in the dark and decadent. Which describes both Darkling's outfit and my own. 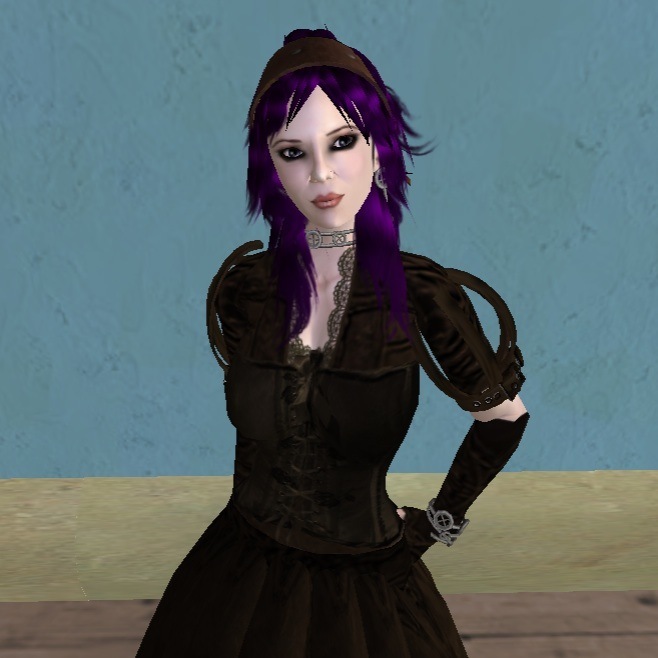 Darkling is wearing Unzipped's Victorian Steampunk ensemble and hair by BettiePage Voyager. I haven't been to Unzipped yet, but I obviously must (damn that bad influence Darkling), because it smells like my kind of store. I'm wearing ~silentsparrow's~ latest, "Dreaded Sunny Day", which reminds me of something Dorothy Vallens would wear in Blue Velvet. The set has lots of parts, including some awesome lingerie and an incredibly adorable tutu, a steal for 400L. Six colors -- go see it all over here. and aye, talk about bad for each oother's pocketbooks... I looked at yehr blog this afternoon and thusly had to go visit Balderdash, and give Saiyge Lotus lotsa linden$! And my David Lynch day comes full circle. Half way watched Dune while working on this set. Which usually leads to this running comment in the back of my mind. "David Lynch did this??? "....well atleast Sting is looking cute"
You tease--whispers the name of some great AO designer and then not tell faithful readers??? Do tell, do tell. Please? - balderdash is worth every linden you can throw at it! - yeah, the lynch dune is so very wild, isn't it? the sci fi version was much more faithful, but lacked the mood. Does that come with a sleigh?